The recreational marine industry followed double-digit August sales gains with a slow-growth September. The recreational marine industry followed double-digit August sales gains with a slow-growth September, adding to the unpredictability of a year marked by inconsistent sales. Sales rose 3 percent in the main powerboat segments to 6,454 and only 1.6 percent industrywide to 9,821 from last September in 24 states that represent about 59 percent of the national market, Statistical Surveys said today. 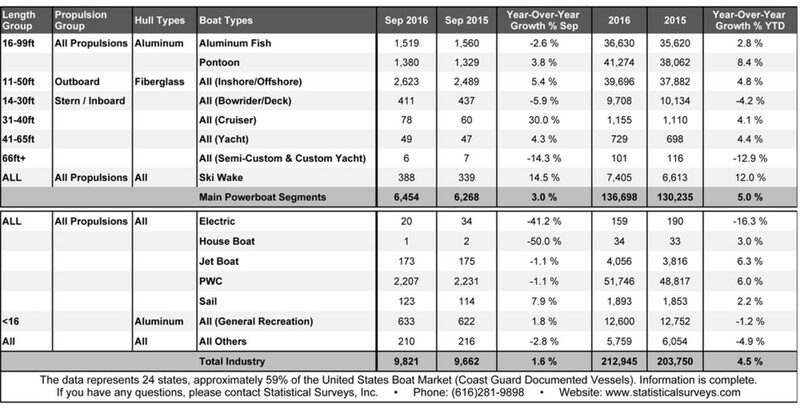 Sales in two stalwart categories — aluminum pontoon boats (up 3.8 percent, to 1,380) and 11- to- 50-foot fiberglass outboards (up 5.4 percent to 2,623) showed moderate growth, but sales of aluminum fishing boats fell 2.6 percent to 1,519. Statistical Surveys sales director Ryan Kloppe said that overall September sales in the early-reporting states were the highest since 2008 and suffered from a comparison with last September, when sales were up 8.8 percent in the main segments and 11.7 percent industrywide in 26 early-reporting states. “To have growth from that is a good comparison,” he said. Sales are up 5 percent this year at 136,698 in the main powerboat segments and up 4.5 percent industrywide at 212,945 through September in the early-reporting states. Kloppe said he remains confident that the industry will achieve sales growth of about 6 percent this year. Sales of ski and wakeboard boats were a bright spot in September, rising 14.5 percent to 388. “It’s been popular for a couple of years now, and [the segment] continues to catch buyers in the market,” Kloppe said. Florida led the nation among the early-reporting states with 2,098 sales, although the total was lower than the previous September, when 2,149 were recorded. Texas was second at 1,456, which trailed its total of 1,590 from the previous year. California was third at 969, up from 791 in a state that is recovering from a drought, a factor Kloppe said appeared to help sales. He said 7,700 boats have been sold in California this year through September, the most since 2008. Ranking fourth was North Carolina at 666 (up from 579) and Michigan was fifth at 621 (down from 648). The rest of the top 10 were South Carolina at 571 (up from 527), Tennessee at 425 (up from 337), Alabama at 419 (down from 424), Washington at 323 (up from 312) and New York at 311 (down from 413). PWC sales fell 1.1 percent to 2,207. Jetboat sales declined by the same percentage to 173. The Coast Guard was up to date in its reports on documented vessels, providing complete figures in the bigger-boat categories. Sales of 31- to 40-foot cruisers rose by 18 to 78. Sales of 41- to 65-foot yachts rose by two to 49 and sales of 66-foot and larger semicustom and custom yachts declined by one to six. Sailboat sales rose by nine to 123.